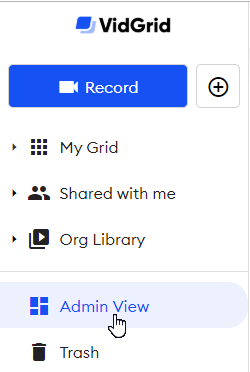 A guide to unique Admin capabilities on VidGrid. Admins on VidGrid have unique responsibilities. The following is a broad overview of the abilities are allowed to perform for their organizations. Admins are able to change each org member’s individual permissions and group memberships. This is possible by going into Account Settings, and clicking on Manage Users. Here, Admins can rename org members, assign org members to groups, change user permissions, delete users, and transfer ownership of users’ videos. Administrators: Can record, edit, upload, and view videos, and are granted permissions (detailed in this article). Creators: Can record, edit, upload and view videos. Select the source user and the destination user, and click on “transfer.” Transferring videos in this way will transfer all of the original user’s videos to the new user’s account. Open the video, and click on the downward-pointing triangle underneath the video next to the current video owner’s icon. Admins are only able to transfer videos between 2 users in their organization. Once a video is transferred, it will no longer appear on its original user’s grid. The original user will also no longer be able to edit or change permissions for the video. Admins have the ability to add new users and assign users to groups within their organization. Check out our article on Managing Users and Groups. The Analytics Dashboard shows an overview of your organization’s video statistics. These include videos created over time, plays of user’s videos over time, statistics by user, and statistics by organization. 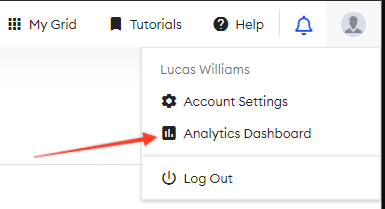 To access the Analytics Dashboard as an Admin, click on your profile icon in the top right corner of your grid. Then click on Analytics Dashboard. You can change the type of graph and the range of dates in the top right corner of each graph. When adding questions to their videos, Admins can save common questions to their organization's default questions library. To add a question, click on the surveys and quizzes icon in the upper right corner of the video. Click on the "library" tab. Click on the "+" next to "Default Library" and create the question you would like to add to the default questions library. 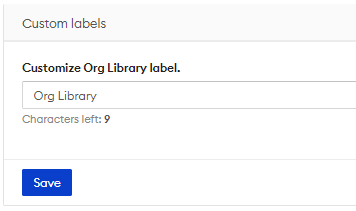 Click "save" and your question will be saved to your organization's default library. 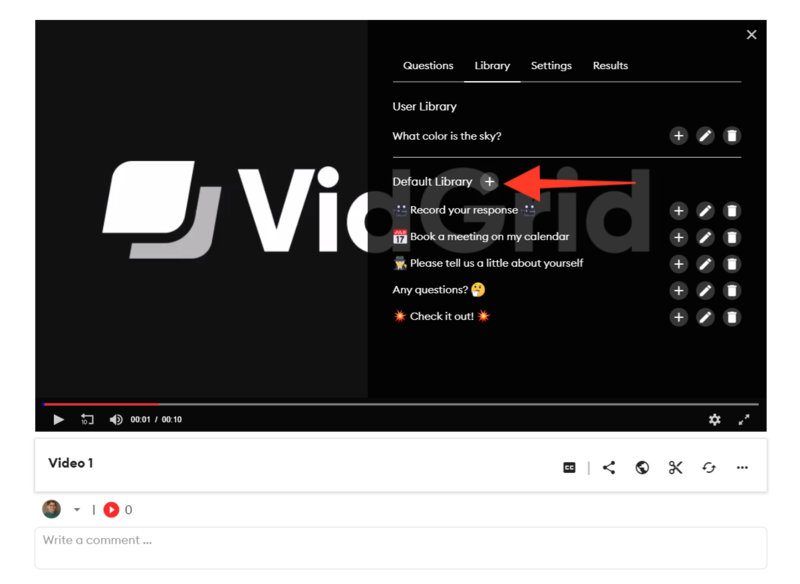 Members of your organization will be able to add questions from the default library to their videos by clicking on the "+" next to the question. For more information about adding questions, check out our article on adding in-video questions. Admins can change their organization’s name and logo on VidGrid from their Account Settings. Check out our article on Custom Branding For Your Account. 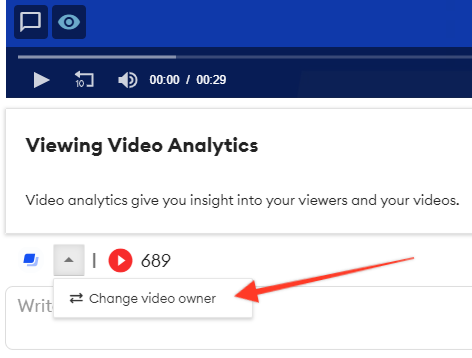 In their account settings, Admins can change the default settings for new videos created by users at their organization. To do so, go to Account Settings, click on Org Settings, and scroll down to New Video Defaults. 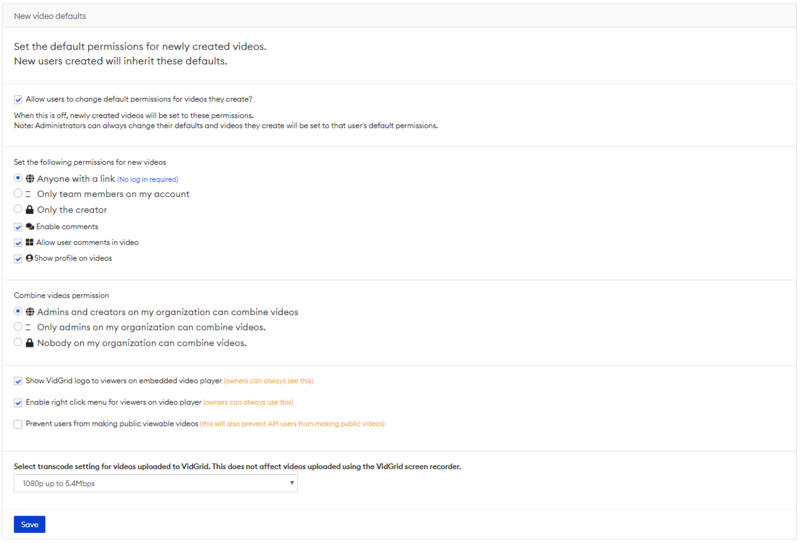 Here, Admins can allow users to change their own permissions for videos, set general permissions for new videos, allows users to combine videos, show the VidGrid logo on embedded videos, enable viewers to open up right-click menus for videos, and prevent users from making videos that are able to be viewed by people from outside of the organization. View all videos in the entire organization's account. Filter and sort by users and custom video attributes. See video. 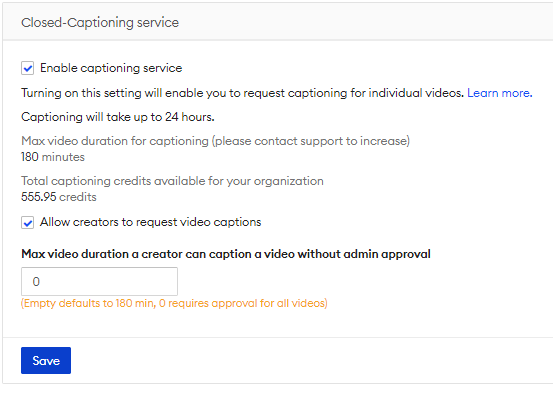 Admins can require users to submit caption requests before captioning their videos. To enable this feature, go to Account Settings, and then Org Settings. If enabled, Admins will receive an email to approve of a caption request every time a user at an organization requests captions. Captions will not be processed until Admins manually approve the request. 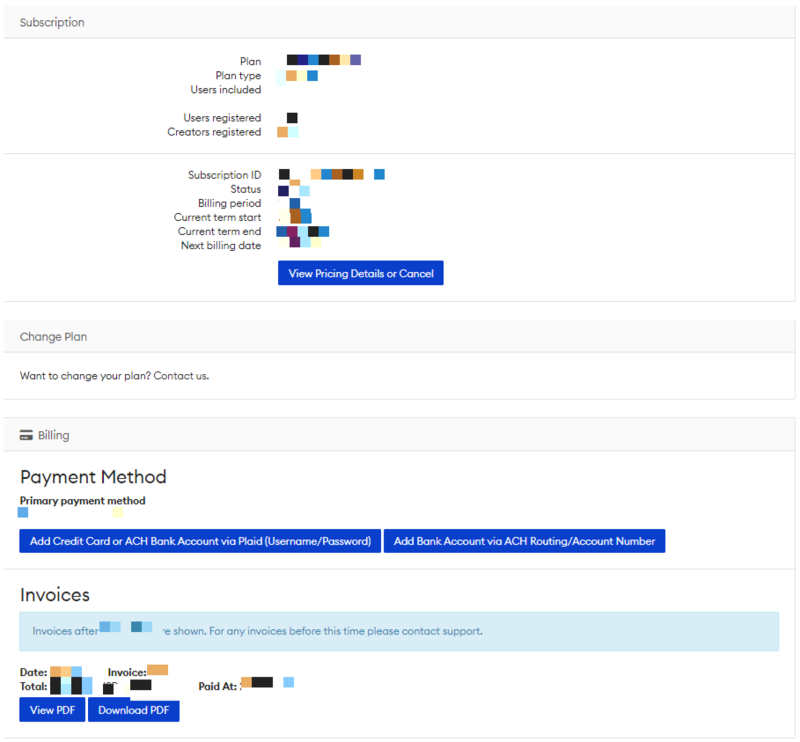 Admins can change their organization’s billing settings by going into their own Account Settings, and clicking on “Billing” on the left margin. From here, you can change your organization’s billing information and look at the latest invoice.